The BullEx Aircraft Wing Fire Training Prop is designed for realistic emergency aircraft fire and rescue response (ARFF) training at an airport or other training facility. 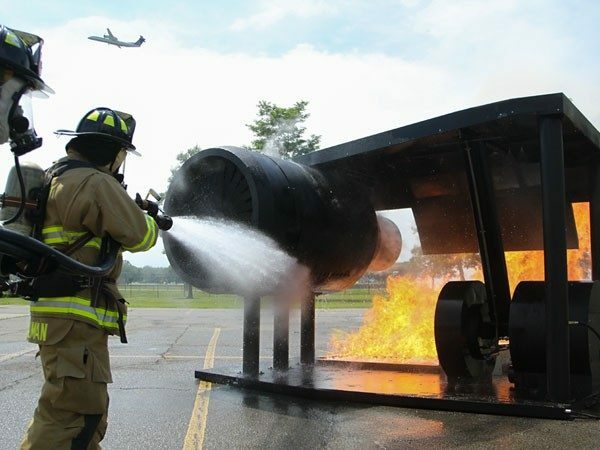 Based on a Boeing 737 or Airbus A320 wing configuration, the Aircraft Wing Fire Training Prop provides multiple scenarios to teach ARFF responders the proper approach and attack techniques. 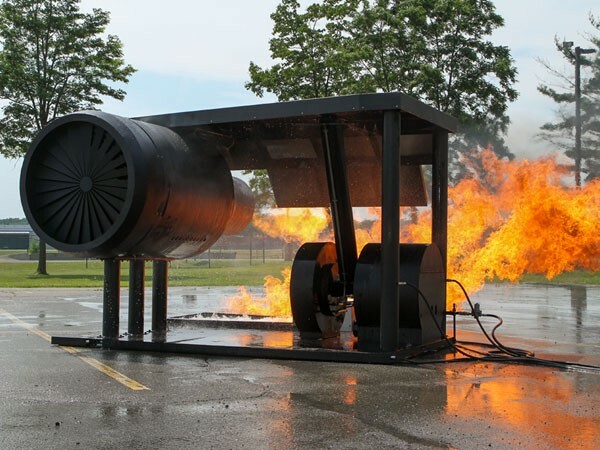 This custom prop features an aircraft engine, landing gear, wing and fuel spill, and provides eight fire scenarios along with realistic smoke and emergency sound effects. 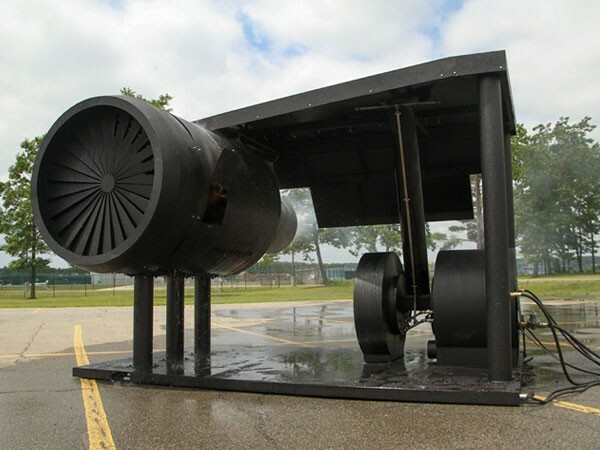 With 150 million BTUs, the aircraft prop offers intense training in a portable structure that can be easily moved to fit your training objective and location. Wheel and Landing Gear Fires The landing gear and wheel assembly is one of the most volatile pieces of the wing assembly. It is particularly vulnerable to fires due to overheated brakes and tires as well as stress related to landing and take-offs. 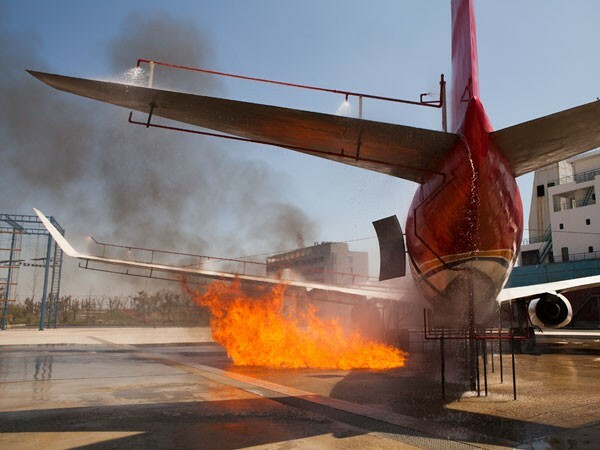 This prop includes mock wheels and landing gear assembly, which feature an overheated brake and integrated brake fire, burning between the wheels, and burning or ruptured tires. The wheel fire provides three flame intensity settings, including extension up to the wing through the hydraulic line. 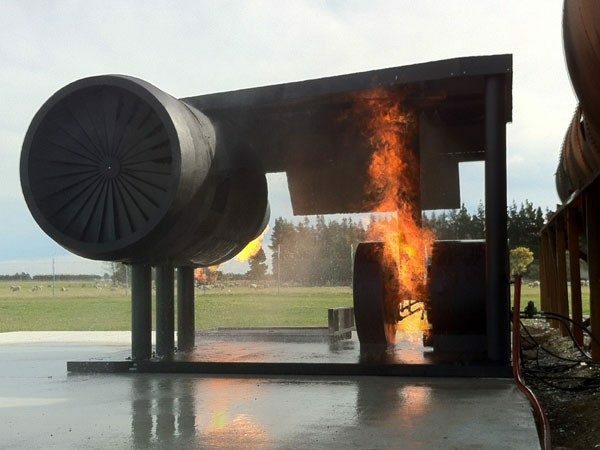 Engine Fire The engine is designed to replicate a full-scale aircraft engine and features mock cowling and damaged turbine blades. 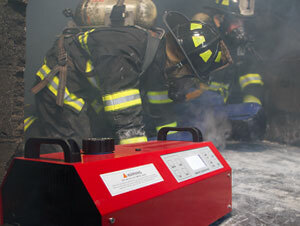 An integrated, but removable, pilot module produces an internal engine compartment fire with two intensity levels and an erupting engine fuel fire, allowing for multiple training opportunities. Electrical fires include a basic Class A wire insulation shortage fire and a fire around the cowling. 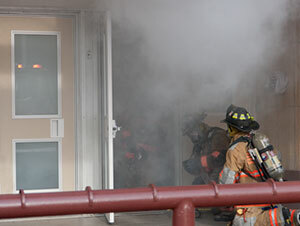 A fire ball scenario can also add an additional element of intensity to training evolutions. 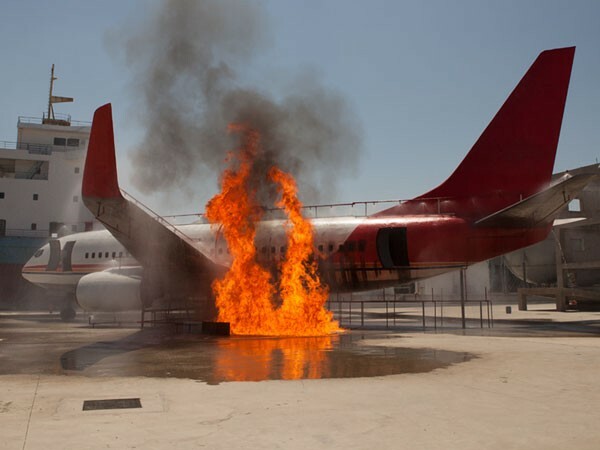 Fuel Spill Fire Training Prop The Fuel Spill Fire Training Prop can be placed near the landing gear of the Aircraft Wing Prop to demonstrate an extension of a wheel fire to a fuel spill fire, adding an additional level of complexity to the response scenario. 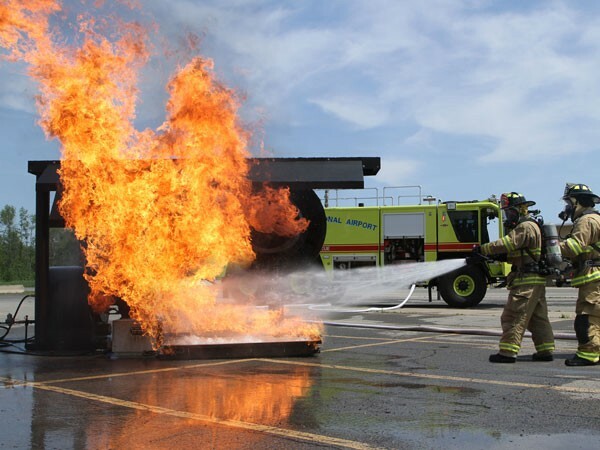 The Fuel Spill Fire Training Prop can also be used separately from the Wing Prop, as a distinct hose line fire training prop to demonstrate fuel spills and other ground-level fire emergencies. Fire Progression and Intensity ControlThe prop’s various fires can be operated individually or in combination to demonstrate a fire’s potential progression through an aircraft wing assembly. 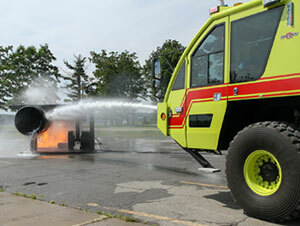 The fire can be made to increase and decrease in intensity, creating various scenarios requiring different fire responses – from a firefighter hose line approach to fully-involved crash truck attack. An incipient stage fire can grow slowly into a larger fire or erupt quickly to create a completely different emergency response scenario. 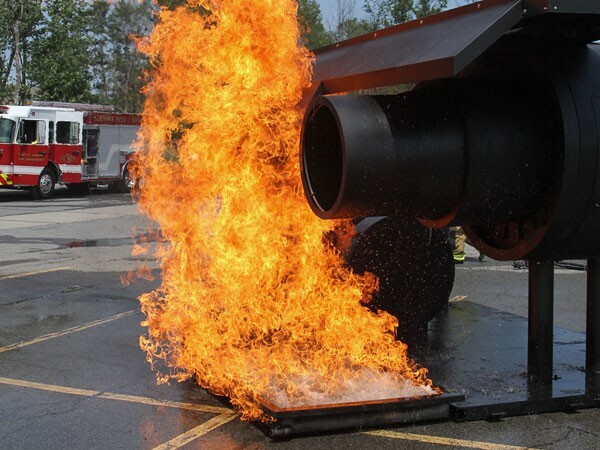 The Aircraft Wing Fire Training Prop is powered by the same force behind all of BullEx’s portable fire training props, the Pilot Module. The stainless steel Pilot Module acts as the brain of the system and connects to the Control Console, which allows the instructor to safely stop and start evolutions. The Pilot Module also houses the forced air pilot system, which guarantees reliable ignition, even under the most demanding circumstances. 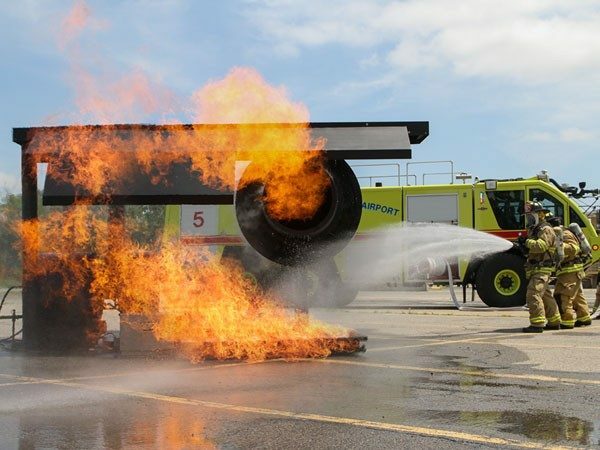 Multiple fire props can be used with the burner tray and pilot module allowing you to cost-effectively add additional props to your training arsenal. 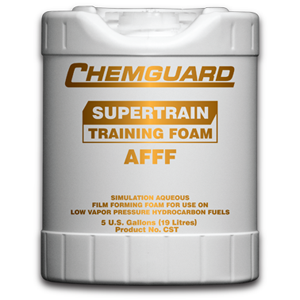 Additional props include a Helicopter Prop, Large Volume Pressure Vessel Prop, Vehicle Prop and any Custom Built Props your training requires. 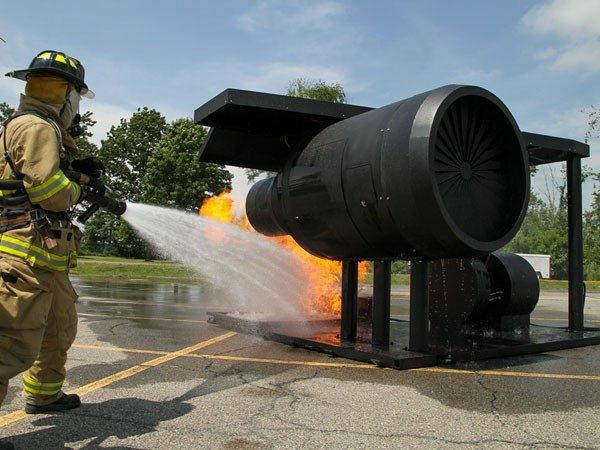 BullEx’s Aircraft Wing Training Prop, along with the entire line of fire training props, is made of the most robust and rugged materials and is designed to stand up the most rigorous training demands. Props are easily interchanged for versatile and diverse training opportunities. Additional props can be added to your collection at any time, allowing instructors to easily refresh their training capabilities.